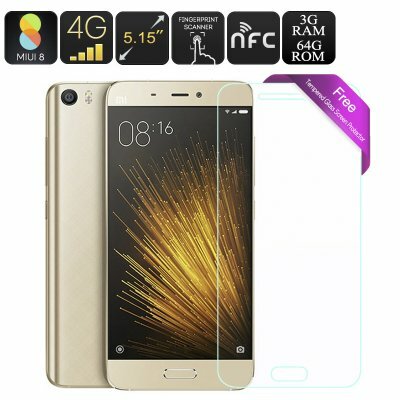 Successfully Added Xiaomi Mi5 64GB Smartphone - 5.15 Inch Display, 1080p, 4G, Dual-SIM, Qualcomm Snapdragon 820, 3GB RAM, 16MP Camera (Gold) to your Shopping Cart. With its 64GB of internal memory, this Chinese smartphone is considered to be the prime edition of the Xiaomi Mi5.This Android phone has been tested as one of the fastest smartphones on the market, outperforming other flagship devices significantly. Although slim in design the Xiaomi Mi5 holds some of the latest and most powerful hardware currently known to the smartphone industry. It’s ridiculously fast Qualcomm Quad-Core Snapdragon 820 CPU has been clocked at 1.8GHz. Backed up with 3GB of RAM and the Adreno 530 GPU this Android smartphone is guaranteed to effortlessly run the latest Apps and most demanding 3D games and movies without dropping a single frame. Running at the MIUI V7 Operating system that has been based on Android 6.0 the Xiaomi Mi5 offers the latest features the industry has to offer. Download and enjoy the latest mobile applications from the Play Store or enjoy a FHD movie on the phone’s 5.15 inch display that holds a stunning 1080p resolution. With a 428ppi pixel density, this Chinese smartphone truly brings media to life and lets you enjoy a stunning cinematic experience from the palm of your hand. Being the prime edition this Android phone holds a magnificent 64GB of internal memory, enough for you to store all your photos, movies, apps, and more, without ever needing to worry about running out of storage space. Featuring Dual-Band Wi-Fi and 4G mobile connectivity the Xiaomi Mi5 provides you with the fastest data connection out there. Download the most demanding games instantly or stream online FHD movies in the blink of an eye – with this Android phone laggy internet connections, buffering pages, and slowly loading videos are an issue of the past. Additionally, the phone’s NFC feature further enhances your user experience by letting you wirelessly transfer files with other devices in lightning speeds. Equipped with a 16MP camera the Xiaomi Mi5 provides you with a professional-grade camera that is capable of snapping magnificent pictures and 4K video. Its auto-focus and smile detection features make mobile photography even less challenging, allowing you to snap mesmerizing pictures as if you were using a professional camera. With this 16MP snapper in your pocket you have the perfect tool to capture and share all special moments in life. The Xiaomi Mi5 comes with a 12 months warranty, brought to you by the leader in Android phones as well as wholesale electronic gadgets..